Citizens Near and Far Say "Yes in my backyard!" 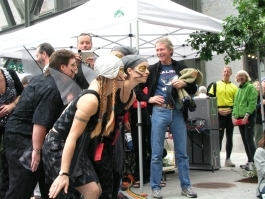 PORTLAND, Ore. — On Sept. 9, 2006, from 10 a.m. to 6 p.m., fisherman, farmers and chefs, foresters, stilters, marching bands and economists will converge in the living room of Portland's Pearl District to celebrate their Salmon Nation citizenship. 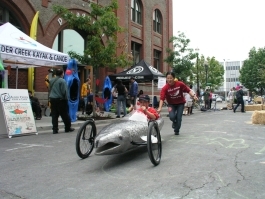 Three years after hosting its inaugural block party, Ecotrust will once again host its signature eclectic street fair/farmer's market extravaganza; featuring live music, a sustainable portable sawmill, a fishing boat and a wild Salmon bake. 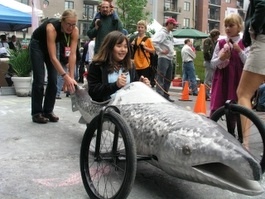 All citizens of Salmon Nation are invited to roister: come say "yes in my backyard!" at the 2006 Block Party. "We throw block parties to meet our neighbors, right?" said Sydney Mead, programs manager, Jean Vollum Natural Capital Center, Ecotrust. "This is a chance to meet your urban and rural neighbors." The Block Party will take place three days after the five-year anniversary of the Natural Capital Center's award-winning renovation. The event will engage, inspire, educate and celebrate Portland, the Pearl, the people, the lands and the waters of the Northwest temperate rainforest. This year's keynote speaker will be Paul Hawken, entrepreneur and author of Natural Capitalism and The Ecology of Commerce. "We are honored that Paul will speak," said Spencer Beebe, president, Ecotrust. "He has been a national leader in conservation economy thinking since the mid 60's, and this event is a celebration of how more and more people are adopting that way of thinking: environmental conservation and economic development at the same time. People are getting it." Festivities will include performance art and processional music by MarchFourth Marching Band, fresh back from their European Tour during the 2006 World Cup. The procession will flow through the Pearl neighborhood and end in the Jean Vollum Natural Capital Center parking lot, joining forces with the Everyone Orchestra in an audience-participation, improvisational performance featuring local and celebrity musicians from throughout Salmon Nation. Nationally renowned Native American flautist Charles Littleleaf will also perform. Time Based Art dancer Jennifer Monson will conduct a migratory dance workshop in Jamison Park earlier in the day, then perform the piece with volunteers near the main stage later that afternoon. Also, Rogue Ales will release their new signature Salmon Nation Block Party brew: Salmon Nation Ale. In addition to live music, dance, fresh food and a tile mosaic assembled by attendees throughout the day, the event is an opportunity for citizens to experience some of the work being done in the forests, fields, cities and harbors of our home. Many of us have heard the term "not in my backyard," to convey unwanted development like toxic waste dumps in our communities. Most times, this is the appropriate response. Salmon Nation is helping us learn how to say "yes in my backyard." On Sept. 9, you'll learn how Salmon Nation citizens are saying "yes" to locally sourced food in our schools, "yes" to bike lanes and public transit, "yes" to Forest Stewardship Council-certified wood in our public buildings, "yes" to landowners who conserve fish passage and "yes" to Native American communities building diverse economies that honor their heritage and wisdom for the land. The event is free and open to the public. Donations welcome. All are invited to enjoy a day of festivities and to meet your neighbors: the people and businesses actively creating a conservation economy in Salmon Nation. The Salmon Nation Block Party is hosted by Ecotrust and presented by Gerding Edlen Development, KPOJ 620 AM, The Portland Tribune and TriMet. The Jean Vollum Natural Capital Center is located at 721 NW 9th Ave., Portland, Oregon. For more information, please call 503-730-4767 or visit www.salmonnation.com/blockparty.